Save yourself time, headaches and even money with these standout Android apps for business travel. Traveling can be a massive hassle, with plenty of room for inconvenience and error. But while there's not much you can do about the late departures, the surly gate attendants, or the smelly fellas somehow always seated right next to you, there are ways you can make your next business trip a little less unpleasant — all thanks to that handy little gadget in your pocket. 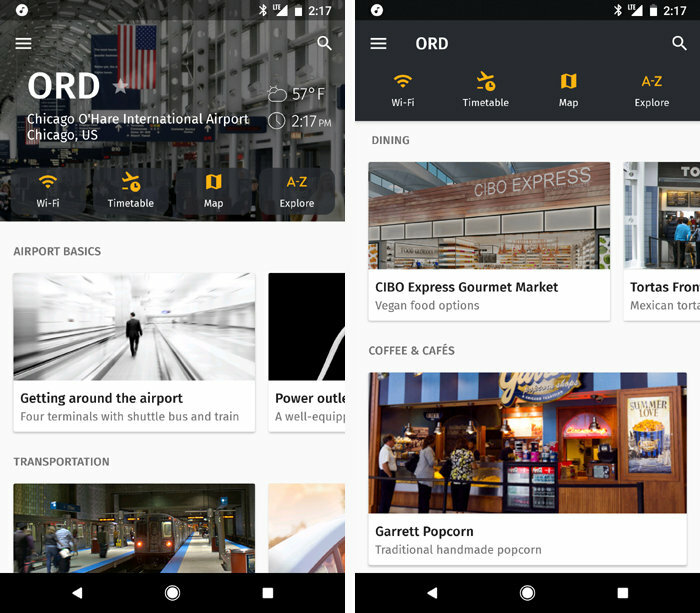 Android's travel app selection has really taken off over the past few years, and the Google Play Store now boasts an impressive array of genuinely useful titles for the traveling professional. After putting numerous standout candidates to the test, these are the apps I'd recommend stowing on your smartphone and keeping at arm's reach whenever your work next has you hitting the road or flying the (allegedly) friendly skies. PackPoint is a travel organization genie. You simply tell it where you're going, when, and what you'll be doing — and the app generates a detailed checklist of suggested items for your suitcase. You can add your own items to the list, as needed, and then use it as a guide to make sure you remember everything, every time. 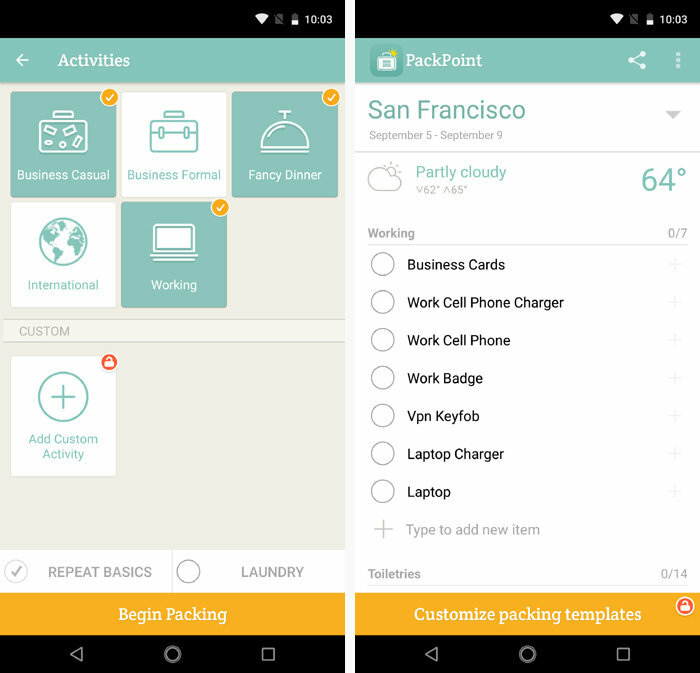 PackPoint takes some of the pain out of packing for a trip. PackPoint is free, with an optional one-time $3 upgrade that removes ads and gives you the ability to create your own custom packing templates. The paid version of the app also integrates with TripIt (more on that in a moment), which means it can import your travel plans automatically and create packing lists before you even ask. Yeah, yeah, I know: You're well aware of Google Maps. But what you might not realize — or maybe have just forgotten — is that with a teensy bit of planning, you can download all the data you need for a trip directly into Maps in advance. That way, you can navigate to your heart's content, even in areas without strong mobile data signals, and you can avoid burning through mobile data unnecessarily on the road. Here's the trick: While you're still in the comfort of your home or office, open up Maps on your phone and search for the city you'll be visiting. You should see its name appear in a bar at the bottom of the screen along with a link labeled "More Info." Tap "More Info," then tap "Download" on the screen that appears. Repeat as needed for any additional places on your agenda, then rest easy knowing your navigational guide will be there and waiting — no matter what sort of conditions you encounter. TripIt is an all-around air travel management companion, and it'll make your life easier in some meaningful ways — especially if you do a fair amount of flying. At its core, TripIt allows you to forward flight itineraries and other travel-related emails to a special address — or, if you want, to grant it direct access to your inbox so it can find and process such emails on its own — and it then extracts all the relevant details and organizes them into clean and easy-to-follow master itineraries. Where TripIt really shines, though, is with its optional $49-a-year TripIt Pro service (which you can try out via a free 30-day trial). That service gives you real-time flight updates all throughout your trip — often beating notifications by airlines' own apps, in my experience, as well as updates to the monitors in the terminal. Once you travel with TripIt — and specifically its TripIt Pro service — you won't want to fly without it. Beyond that, TripIt Pro makes it dead simple to find alternate flights at any point in your adventure. If a connection is canceled or delayed, all it takes is a couple of taps to see what other flights are available — even down to the specific open seats — on your current airline or on another. On a recent trip I made to Boston, that helped me stay a step ahead of the gate agent when a late departure put my connecting flight in jeopardy. TripIt Pro comes with a few other perks, too, such as a one-time $25 credit to LoungeBuddy for airport lounge access. 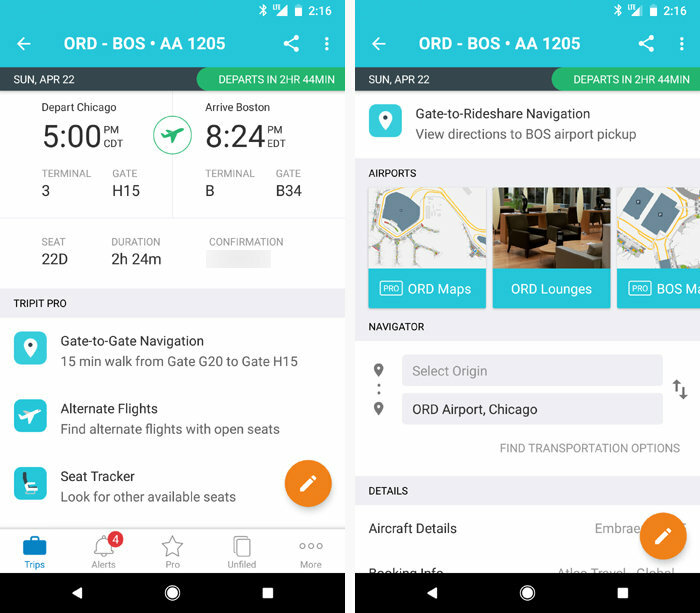 But the notifications and alternate flight finder are what really make the app invaluable — a must-have for any frequent flier or business traveler. Forget all the clunky, upsell-infested flight-finding apps and services. Instead, open up your Chrome Android browser and navigate to Google Flights. OK, OK, technically it isn't an Android app, but Google's flight service makes it super-easy to search for flights across all airlines. You can save or share potential itineraries and then book your travel directly with whatever airline (or airlines) you choose. Pro tip: If you want to make the app easier to access, tap Chrome's three-dot menu icon while viewing the website and select "Add to home screen." That'll give you a more traditional mobile-app-like icon that can then pull up the tool with a single tap. FLIO does a bunch of different things, but the function you want is its ability to act as your guide to airports all around the world. As soon as you land, the app will fill up with all sorts of info relevant to your terminal — interactive maps, dining suggestions and detailed instructions on connecting to available Wi-Fi hotspots in the area. It allows you to find and book access to airport lounges, too, and even reserve rental cars and parking spots at some locations. FLIO is full of helpful info for making the most of your time in an airport. FLIO also serves up occasional discounts for shops and services. On a recent trip to Boston, for instance, it popped up an offer for $5 off at the spa in my connecting terminal (though it regrettably gave me no coupons for tacos, which I far more urgently required). If you're traveling internationally — and have a valid passport from the U.S. or Canada — the Mobile Passport app can save you precious time when you enter the U.S. by allowing you to submit your passport info and customs declaration form through the app upon landing and then skip the regular line on your way through border patrol. Despite its name, the app does not replace your passport; you still need to carry that with you. And not to worry: It's authorized by the U.S. Customs and Border Protections agency and totally legit. If you drive your own car for business, Microsoft's MileIQ makes it easy as can be to keep track of all your mileage for later reimbursement. Once you set up the app on your phone and activate its "Drive Detection" feature, you don't have to do a thing: It'll automatically detect when you're driving and then log all your miles in the background. It even uses current IRS-mandated reimbursement rates to calculate what you're owed. The app has some interesting advanced options, too, such as the ability to set specific work hours and then ignore any drives that occur outside of those times. MileIQ is free to use for up to 40 drives per month. For unlimited access, you'll have to pony up $6 a month or $60 for a full year of service. When it comes to more general expense-tracking, Expensify is the app to have in your arsenal. 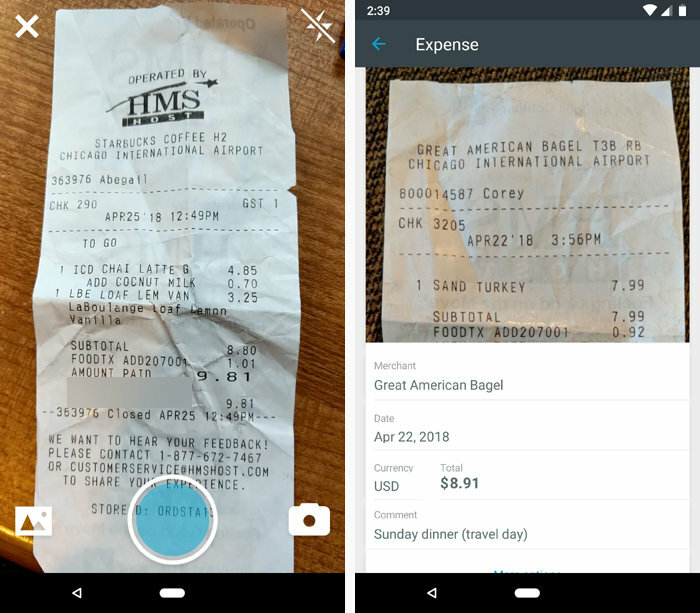 Expensify lets you simply take photos of receipts with your phone — or forward invoices and receipts via email — and it then extracts the relevant details and organizes them into reports. The app is available on the web as well, and it offers direct-export integrations with QuickBooks, Xero, and other accounting services. Snap a photo of a receipt — or forward it in via email — and then forget about it with Expensify. Expensify costs $5 per user per month for individuals or teams and also has corporate- and enterprise-level plans available. You can try the app out with a free plan, too, though that limits you to just 10 imports per month and lacks many of the service's advanced expense reporting and integration features. Google's Datally app can help you cut back on mobile data usage in a number of ways, but the feature most relevant to this roundup is its ability to give you an interactive list of available Wi-Fi networks nearby. It'll let you know if they're password-protected and can even help you navigate closer to any of them with a tap. Getting connected doesn't get much easier than that. For your next border-crossing journey, let XECurrency convert currency for you without the headache. It's free with ads or $2 for a premium version. And when language translation is what you require, the aptly named Google Translate app is the tool you want. It's jam-packed with practical features, such as the ability to translate text instantly from an image you capture with your camera and a "conversation mode" that lets you have a (somewhat awkward) back-and-forth dialog, in real time, with someone speaking a different tongue. Who says you have to stay sedentary just because you're traveling? 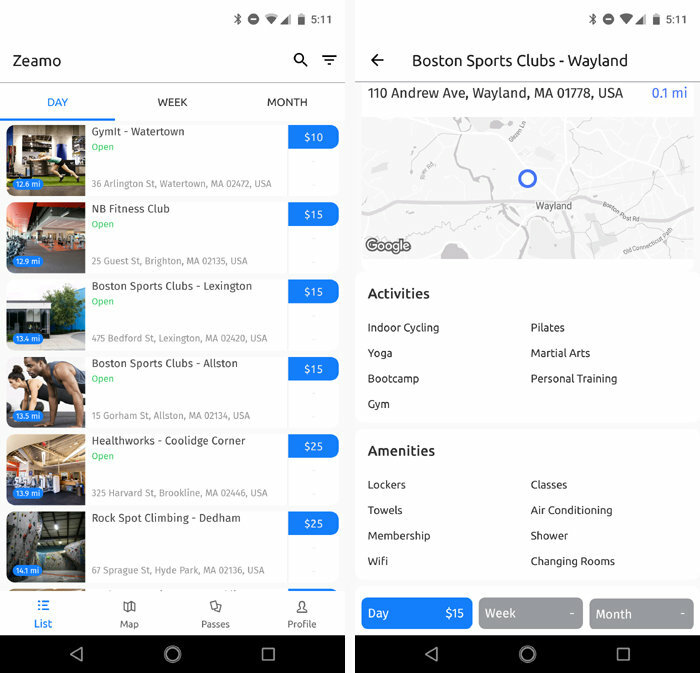 Skip the underwhelming hotel "exercise facility" and check out Zeamo, which shows you a list of gyms and fitness centers in your vicinity and lets you buy day, week or month passes from right within the app. Zeamo helps you find nearby fitness centers and then buy passes for short-term access. If you'd rather head outside to get your sweat on, RunGo lets you find and then navigate popular running trails in any locale. It's free to use, with an optional $2-a-month or $15-a-year premium upgrade that gives you a variety of extra features you probably won't need (unless you really want to sync the app with a Strava activity tracker). And if you'd prefer to get your heart pumping from the privacy of your own room, snag the Nike Training Club app. It's filled with easy-to-follow workouts ranging from the intense and Crossfit-reminiscent "Bodyweight Only Benchmark" to the simple and stretch-oriented "Run Ready Yoga." You can find workouts for practically any amount of time you want — as little as five minutes, even! — and you can browse specifically through "no-equipment workouts," assuming you don't carry your entire collection of kettlebells and medicine balls with you whenever you travel. The only thing you'll be missing is an excuse.